It's Sunday, which means it's time for another introduction to one of the brands that will be sold at Healuxe Beauty! Today I want to introduce you to Little Barn Apothecary, an all-natural beauty brand that was started this past year and consists of some of the most beautiful packaging, fabulous ingredients and overall wonderful products that I've ever come across. The line consists of everything from skincare and bodycare to home fragrances, and the collection is still growing. Every product consists of a handful of carefully chosen ingredients that are truly simple yet effective. I've been using a few of their products consistently for the past few weeks now and have been truly loving every single one. In fact I've been using their Simple Lip Tint (a burgundy tinted balm for both lips and cheeks) on a daily basis - it gives the most beautiful flush of color to your face, and is foolproof to apply. 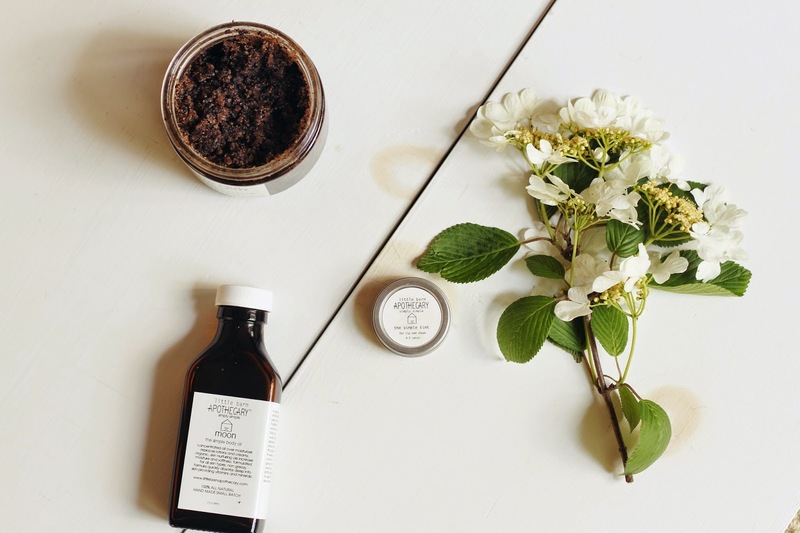 Another product I've been getting a ton of use from is their wonderful Simple Coffee Scrub. Aside from the unbelievably wonderful coffee scent that comes from the organic fair trade coffee grounds found in this scrub, it is also hands down one of the most effective body scrubs I've ever used. The combination of coffee grounds and pure cane sugar work together to energize your senses and reinvigorate your skin on a cellular level - the scrub is easily exfoliates without ever feeling too rough on your skin. Instead, the ingredients leave your skin feeling significantly softer and smoother than ever before. After using the Simple Coffee Scrub in the shower, I've been moisturizing my skin with the brand's lovely Simple Body Oil in Moon. With oils such as jojoba and hemp, this gem is not only incredibly moisturizing but also smells divine. The scent is described on the brand's site as being lightly floral and citrus-y, which I think is a pretty good description of what to expect with this guy. The smell is lightly herbal and wonderfully fresh without ever being too overpowering, which is exactly what I look for in my body oils. Overall I have been so impressed with Little Barn Apothecary, and can see why the brand has been getting so much attention as of late. Every product is simple yet powerfully effective and I adore each of the carefully chosen ingredients. I can't wait for you guys to try it out! If you get a chance, check out their website, and I'd love to hear what products from the brand you guys would like to see over at Healuxe! What an adorable name! Their products seem really pure and I like how they're relatively affordable.